Jan Zabinski (Johan Heldenberg) and his wife Antonina (Jessica Chastain) run a zoo in Warsaw Poland. In the summer of 1939, just before the German blitzkrieg, they befriend a German zookeeper named Lutz Heck. (Daniel Bruhl) After the Germans take over Poland, Jan and Antonina decided to stay in Poland and Lutz, now a Nazi officer, makes them an offer to breed their best stock in a zoo in Germany. The couple accepts the offer, and also an offer by Lutz to breed an extinct species of cattle called aurochs, from modern day bison in the Warsaw Zoo. Johan wants to breed pigs to feed the German troops guarding the zoo, and Lutz accepts the offer. But the pig-breeding is just a smokescreen to allow Jan to smuggle Jewish men women and children out of Poland during the height of the war. Antonina is initially hesitant, but she is won over when she sees the brutal condition of the children Jan rescues from the Warsaw Ghetto. Does Lutz Heck ever find out the true nature of what’s going on at the zoo? The Zookeeper’s Wife may not be as gripping a story as Schindler’s List or Judgement at Nuremberg, but it’s a far more personal story, and in that way it makes it a more intriguing story in some ways, than the more well-known stories. Jan and Antonina were ordinary people, they weren’t a famous industrialist or member of a military tribunal, they saw society starting to turn evil before their eyes, and they did something, at great risk to their own lives. Depictions of Jews wearing armbands and being segregated for their faith into ghettos, and finally being “resettled” to the death camps in Poland like Auschwitz and Treblinka are always riveting and heartbreaking, and this movie is no exception. But the writers exaggerated the advances that Heck made toward Antonina, and that is a mistake, the story itself is dramatic enough, it needs no embellishment. The performances are very good. I love Jessica Chastain, and although she struggles with the Polish accent, she gets the right tone for Antonina, somewhere between sorrow and desperation, and giving the character the courage to help those in need. The best acting job in the film was not from Chastain however, the best performance in the film is by Johan Heldenberg, as Jan. He balances his concerns for the fate of the Jews in Poland with concerns about the health of his marriage. Heldenberg gives a complex performance, Jan is sensitive yet strong. Daniel Bruhl overdoes the evil Nazi routine with his portrayal of Lutz Heck, but Heck was interested in genetics, and that in the context of Mengele’s experiments on Jews, is evil. The direction is ok, the pacing is good, but this is a somewhat sanitized view of the Holocaust, there’s not much evidence of the Nazis’ brutality, a lot of the brutality is inferred, which is dangerous, because the assumption made is that everyone watching this movie knows about the Holocaust, and with each passing generation, that’s a dangerous assumption to make. The Zookeeper’s Wife: A powerful story despite not visualizing Nazi atrocities. Elizabeth Sloane (Jessica Chastain) is a lobbyist. She has engaged in some pretty morally reprehensible things, but she supports her causes unquestioningly. But when her boss, George Dupont, (Sam Waterston) asks her to support a campaign to make women more ardent gun rights supporters, she refuses to work on the campaign and moreover quits the lobbying firm and joins the Brady Campaign, a gun control organization. Elizabeth takes along five co-workers, she wants to take a sixth co-worker, but her protégé, Jane Malloy (Allison Pill) stays behind. Undaunted, Elizabeth joins the Brady campaign, and befriends Esme Manucharian (Gugu Mbatha-Raw) a fervent believer in gun control who confides her reasons to Elizabeth, but wants to keep her reasons private. Elizabeth wastes no time in raising money for her new found cause, from wealthy donors like Evelyn Sumner (Christine Baranski) and she gets to work flipping Senators’ votes, 60 is the magic number to withstand a filibuster. But her slash and burn tactics, and her reckless proclivities anger her political enemies and endanger her friends. Finally, in a desperate attempt to stop her momentum she is called in front of the Senate Ethics Committee to testify by Senator Ronald Sperling. (John Lithgow) What comes out at the hearing? Does the bill Elizabeth is championing pass the Senate? Miss Sloane tries very hard to be a sophisticated version of Mr. Smith Goes To Washington. But it really is a sad day in America when a lobbyist is a protagonist in a political drama. Mr. Smith was a political neophyte and a complete innocent, and that was part of the charm of that movie. This movie has no charm, it portrays cynical move after another. And it’s not very realistic, either. If flipping votes in the Senate was as simple as pulling a few political stunts, than fighting the NRA would be easy. It is not, If Newtown Connecticut can happen and the Congress can’t pass background checks, then nothing will ever defeat the NRA. So this is just Hollywood wish fulfillment, if Congress can’t pass the real thing, Hollywood can make it up. And it doesn’t even work as wish fulfillment, because it’s so overtly political, and people, all people, go to movies to escape politics, not to revel in it. I really love Jessica Chastain, because she enjoys playing a wide variety of roles, and she plays them all pretty well. She really ties hard to play a tough woman and yet make her likeable, it’s a tough job. I only wish the script was better and not so contrived, I still like Chastain, but I doubt that anyone could have pulled this role off. I like Gugu Mbatha Raw too, but the writers make her a victim throughout the film, and she is never allowed to break out of victim mode. And she disappears almost completely near the end of the film. John Lithgow seems to enjoy playing a puppet politician, but again his role is too predictable. The direction is nothing special, the pacing is slow at times the movie is very long, and takes a long time to get to its ending. The director doesn’t get great performances from anyone in particular, and the ending is predictable. Miss Sloane: Misses the mark. Edith Cushing (Mia Wasikowska) is an independent woman growing up in Victorian era America. Ever since her mother died when she was a child, she is plagued by visions of ghosts. She is unmarried and likes to write ghost stories. There are two potential suitors who show interest in Edith, one is an eye doctor named Alan McMichael (Charlie Hunnam) and one is a baronet and inventor named Sir Thomas Sharpe. (Tom Hiddleston) Sharpe has invented a drill for clay mining and is seeking investors in the U.S. Edith’s father, Carter Cushing (Jim Beaver) is highly skeptical of Thomas and hires a private investigator named Holly (Burn Gorman) to look into Thomas’ background, and when he finds information about him Carter then pays him to go back to England and break Edith’s heart, which he does. After her father is suspiciously murdered, Edith runs off to England to marry Thomas and live him and his sister Lucille (Jessica Chastain) in England in his mansion. As she goes to England, the ghosts that infest Edward’s mansion continuously warn Edith about her new surroundings. Soon she is coughing blood and Thomas and Lucille are acting more and more suspiciously. Back in America, Alan is trying to deduce who killed Carter. Who did kill Carter? What are the ghosts trying to tell Edith? I like Crimson Peak It reminds me somewhat of Jane Eyre, Edith is an independent girl who goes to England to marry a baronet. Jane is an independent girl who starts out as a nanny and seeks equal footing with Rochester. Jane Eyre had the gothic touch, Bertha, Rochester’s wife is stashed up in the attic, in Crimson Peak, Lucille complains that she was kept in the attic by her mother. There’s also a bit of Shakespeare, Hamlet and Ophelia thrown into the mix with the Thomas and Lucille relationship. There are also elements from “Fall of The House of Usher” and “The Grifters.” With touchpoints so familiar, it’s simple to see why this plot is so inviting. “Ghosts are real.” says Edith in the very beginning of the movie, and she seems neither scared nor intimidated by them. That is a refreshing viewpoint. There are some less than stellar moments, why would Edith, a smart girl, run off to marry a guy her dad warned her about, so soon after he was suspiciously murdered? And for a movie that strives to be an intelligent film, and often succeeds, why does the last 15 minutes resemble a slasher film? But overall, Crimson Peak is a creepy suspenseful mystery film. The acting is very good. Mia Wasikowska is very good as the spirited Edith, and yes she did play Jane Eyre in 2011. Jessica Chastain is excellent playing the sly, seductive, secretive Lucille. The more the viewer gets to know her, the more repulsive she is, but the more the viewer wants to know. She is proving to be a versatile actress. Tom Hiddleston plays Loki in the Thor movies, so playing a bad guy is old hat for him, and he does it well in this movie. He is a shyster, but a charming shyster. On the negative side, Charlie Hunnam plays the protagonist blandly, and again like Pacific Rim, struggles mightily with an American accent. Burn Gorman, who played one of my favorite roles in Pacific Rim, had a small role in this film. Guillermo Del Toro is one of my favorite director/writers. Pan’s Labyrinth and Pacific Rim are two of my favorite films. Del Toro never forgets that film is a visual medium , and in this film everything seems to be bathed in red, and there is one interesting close-up of ants devouring a monarch butterfly that amps up the creepy factor. There’s always something visually provocative in his films and I like that. Crimson Peak: A peek inside a creepy aristocratic family. Commander Melissa Lewis (Jessica Chastain) is exploring Mars on a mission for NASA. Without warning, a windstorm approaches, and botanist Mark Watney (Matt Damon) is impaled by an antenna, and presumed dead. Lewis and the rest of the crew reluctantly leave Watney behind, and head for Earth. 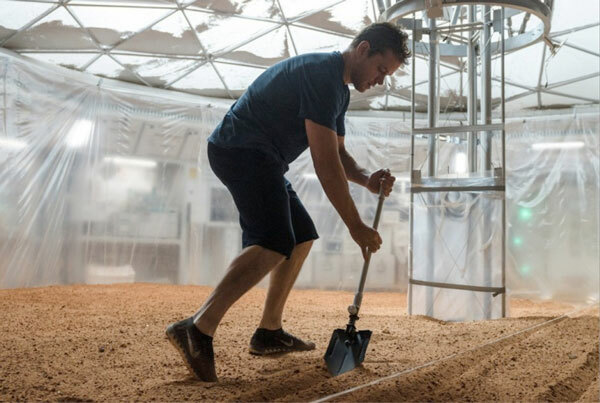 Watney however is alive and uses extreme heat sources to split hydrogen atoms, create water, and fertilize the Martian soil with his own feces to grow potato plants. Meanwhile, back on Earth, Mindy Park (Mackenzie Davis) realizes while viewing satellite pictures, that the Mars rover has been moved. Park summons Vincent Kapoor, NASA’s director of Mars operations (Chiwetel Ejiofor) and they conclude Watney is alive. Kapoor in turn tells NASA director Teddy Sanders (Jeff Daniels) that Watney is alive. Sanders decides not to tell the public until they have a plan to communicate with him and at the very least resupply his food supply. Watney is working on the communications issue, he is driving the rover to the Pathfinder. When Kapoor realizes where Watney is going he gets the Pathfinder crew together, and works on getting the communications satellite on Pathfinder up and running, Kapoor communicates with Watney first through hexadecimal and later through some kind of instant messaging system. The rescue mission is more complicated. Sanders doesn’t want to tell Lewis and her crew that Watney is alive, for obvious reasons, so he concentrates on a food re-supply mission. But the rocket that the Jet propulsion lab builds blows up, so Sanders has to come up with another plan. He comes up with a plan that involves a Chinese booster rocket and a second food supply mission, but Rich Purnell (Donald Glover) has a much more ambitious plan involving the Chinese booster rocket and Commander Lewis’ ship. Do the Chinese give NASA permission to use their rocket? Does Commander Lewis get wind of Purnell’s plan? Do they think it’s feasible? I liked the film adaptation of the book the Martian. The problems I have with the story are the same problems I have with the book. Can hydrogen be turned into water on Mars, even in a climate controlled environment? Can the Martian soil be fertilized so easily, by just dumping human feces on it? Would the Pathfinder communications satellites be working after all those years of lying dormant on Mars? My mind was reeling with questions, after reading the book? But the screenplay is better than the book in this way, the book tends to get bogged down in scientific terminology when trying to explain how Watney survives. The screenplay streamlines the explanations and exposition, and gets from stranded, to survival to rescue mission much faster than the book does. The humor in the book is also a vital part of the screenplay. The direction by Ridley Scott is fast paced and decisive, he doesn’t linger too long on any one scene for too long. The CGI is well done and really looks like the surface of Mars, the scenes in outer space are credible and Scott gets great performances out of the cast, although with a cast like this, that is not hard to do. The Martian: Better Red (Planet) Than Dead. Cooper (Matthew McConaughey) is an engineer by training, relegated to being a farmer because a blight has ravaged the country and the world and farmers are a necessity. Cooper and his daughter Murph (McKenzie Foy, Jessica Chastain, Ellen Burstyn) is led by gravitational anomalies, to a secret NASA installation, where a professor named Brand (Michael Caine) is working on a formula that makes interstellar travel possible. The same gravitational anomalies that brought Cooper and Murph to the NASA installation has opened up a wormhole and revealed three habitable planets in a galaxy that is suddenly within reach to a human population who desperately needs it. Are the gravitational anomalies naturally occurring, or is humankind being led by a heretofore undiscovered intelligence? Does Cooper accept the challenge of finding these new worlds and finding one habitable enough to colonize? 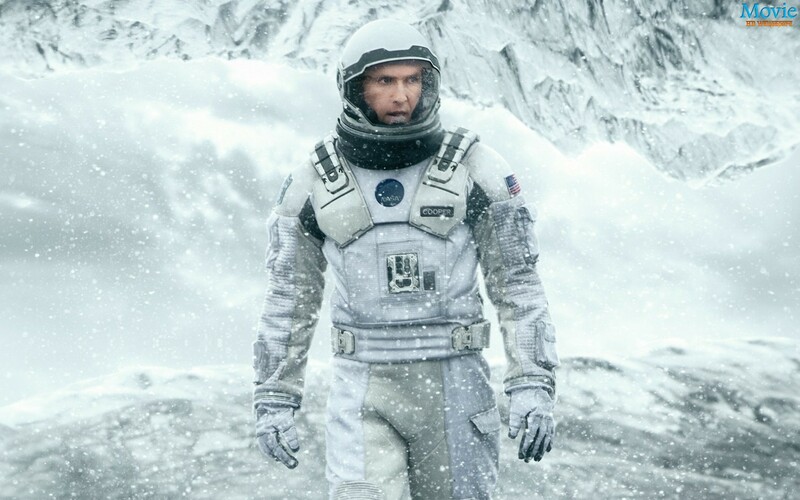 There are so many themes explored in Interstellar, that it’s difficult to encapsulate them all here. First and foremost, it’s a character study, about what motivates man. Is it self-preservation, animated by dark motives, or is it selflessness motivated by love of self and others? The choice is up to mankind. The movie also infers environmental issues by visually recalling the Dust Bowl, there are parts of this movie that seem to use snippets of the Ken Burns documentary The Dust Bowl. There are issues of the government conscripting people, limiting their intellectual mobility, and whitewashing scientific accomplishments of the past. Why does NASA have to operate in secret in this society? That fact in itself speaks volumes. Overlaying all of this is the interplay of father and daughter, the sense of betrayal she feels. Betrayal is a huge theme in this movie explored through many characters in many situations. The story unfolds so beautifully and the science fiction elements are so interestingly intertwined in the film, and so thoughtfully explained that it enhances the movie greatly. The robots are humorous and one resembles and ambulatory monolith a tip of the cap to 2001: A Space Odyssey. I did have a problem with the ending, Chris Nolan does try to tie up some loose ends with the ending, but it strains credulity. The acting is top drawer. McConaughey continues a wonderful string of roles starting with Mud. He gives a nice understated urgency to his role. He leads by example and people are drawn to his leadership. Anne Hathaway turns in another powerhouse performance, with a complex character portrayal of Professor Brand’s daughter, Amelia. She has issues of guilt, that her character has to deal with, not only is she not a damsel in distress, she acts heroically at points in the movie. Jessica Chastain plays another complex character, building on her strong roles in Zero Dark Thirty, Mama and The Debt. In this movie, her character has to overcome abandonment issues and pursue her natural love of science. Matt Damon has a small but interesting role, that is integral to the movie. I love his performance. The cinematography is amazing, even before the viewer gets to space. The space scenes are really reminiscent of 2001: A Space Odyssey, there are lot of silent scenes, in space and that reminded me of 2001, It’s as visually astonishing as Gravity, and all done without green screen or CGI. The movie is nearly 3 hours, but the pacing is exquisite, I never looked at my watch, once. I just watched the multi- generational space epic unfold before my eyes. Lucas (Nicolaj Coster-Waldau) is the uncle of two nieces, the older one, Victoria (Megan Charpentier) and the younger, Lilly (Isabelle Nelisse) have been abandoned in a cabin for five years. The girls get psychological help from Dr. Dreyfuss (Daniel Kash) and a battle for custody begins, between Lucas and the girls aunt Jean. (Jane Moffat) Lucas us unmarried, and his girlfriend, Anabel (Jessica Chastain) plays bass. Remarkably, Lucas and Anabel gain custody of the girls, and Dr. Dreyfuss continues his treatment of the girls. The doctor finds out from Victoria that a woman named Mama helped the girls survive during their five year ordeal, but the psychologist thinks that Mama was a coping mechanism. Meanwhile Lucas is hospitalized after falling down the stairs, and that leaves Anabel alone in the house with the girls. Then Anabel starts hearing noises in the house. Is Mama a coping mechanism for two abandoned children? Or something more sinister? The premise of this movie starts out a little shaky, young children abandoned in a cabin for five years. Kids abandoned for five years would be dead, and there are standard horror conventions, spooky cabin, suburban house, strange noises, and the movie seems to telegraph its punches, I knew when the horror was coming and that made it less scary. But the story held my interest, at least until the reveal, partially because children telling a scary story is always more scary than adults telling a scary story. The ending is somewhat corny, but overall, it was a pretty good movie. What made me like this movie so much? Jessica Chastain was excellent in in a really different role for her, she was a rock n’ roll chick in this film, complete with tats, very different from Zero Dark Thirty or The Debt. Yet, gradually when she meets these girls, she becomes incredibly materialistic, and seeks to protect these girls from whatever is bothering them. The transformation was very believable. The little girls are incredibly creepy, especially the younger one, and that adds to the suspense. Daniel Kash kept me guessing as the psychologist, it was a really interesting performance. So here is a case where strong performances overcome a somewhat weak and predictable story. Mama: Not the mother of all horror movies, but pretty good. Maya (Jessica Chastain) is a CIA agent who has been working on finding Osama Bin Laden since 9/11/2001. Since the attack on the Twin Towers, the CIA has been given expanded powers to extract information from detainees, including stress positions, sleep deprivation, loud music, and waterboarding. Maya’s colleague Dan (Jason Clarke) seems to enjoy the torture of one detainee in particular. The detainee’s name is Ammar (Reda Kateb) and the CIA hopes that Ammar will eventually give them the name of Bin Laden’s main courier, Abu Ahmad. (Tushaar Mehra) It takes seven years from when they get the tip on Bin Laden’s courier and, when they can track that courier to Bin Laden’s compound in Abbottabad, Pakistan. The President then sends in Seal Team Six to raid the compound and the world found out what happened next, Osama Bin Laden was killed. This is a difficult movie to watch. I didn’t mind seeing the scenes of torture as much as I thought I would, because it was all known information, but there is a difference between reading an account of torture and seeing it on a big screen. It is quite startling to see it. Seeing these scenes might incite some anger when this movie shown around the world. What I really did mind is the conclusion that this movie draws, that harsh interrogation is an effective means to extract information. It is not. FBI interrogator Ali Soufan, who interrogated Abu Zubaydah says he was able to extract much more information when he treated Zubaydah humanely. Colleen Rowley, another FBI agent says torture doesn’t work, that the goal in an interrogation is to establish a good relationship with the person being interrogated, that is called the Reid School of Interrogation. But the movie ignores this empirical evidence and seems to revel in the myth that torture works, and since this is a movie, people might see this dramatization, this movie and accept it as truth, and that is dangerous. I blame Mark Boal the writer of this movie for oversimplifying a really complex political and moral issue, and his excuse for this oversimplification, it’s a movie and he was using artistic license. I’m sorry, but this explanation is not acceptable, when someone is giving the first big screen account of how the United States killed Osama Bin Laden, it better be accurate to a fault. Jessica Chastain is not as good as I thought she would be in this film. Since she essentially has to carry the film, I thought she would be a lot stronger in this role. Despite a lot of buzz, I did not think she deserved an Oscar, and she lost to Jennifer Lawrence. Is this movie worth seeing, I would say yes, if only for the Seal Team 6 footage, the last 45 minutes of this film is compelling viewing, and is well worth the price of a rental. Zero Dark Thirty. The end of a dark chapter in U.S. history.